If someone asked you to define Bravery what would you answer? Probably something like “Being brave means you take risks without being afraid.” Which might be a fine definition, but I think its missing something. When I left a Full Time job with benefits, to start my own company lots of people thought I was being brave. I didn’t really see it that way, and still don’t. For me it was the next logical step in a career where I was constantly working for companies that had shrinking IT needs. Or they were showing signs of instability. I’ve been laid off once before, and I’m not willing to put my livelihood into the hands of someone else. In the last few years as my kids discovered a love for Thomas and Friends. 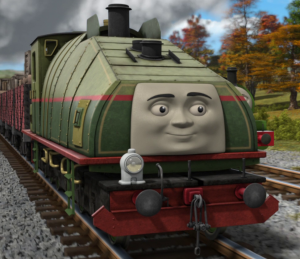 My daughter Molly’s favorite Engine on the Island of Sodor is a funny looking one called Gerald but he goes by the nickname “Gator”. You need to know a few things about Gator. That’s right, the creators of this series designed and built this character with a flaw that directly opposes what he is supposed to be used for. Sound familiar to anyone? I meet IT admins all the time, who are good at what they do, they love it and would say it’s what they’re supposed to be doing. Yet they are often crippled with fear of the “what if”. What if even though I tested something, I deploy it in production and it takes down the whole company? What if my company gets hit with Ransomware and we can’t get important data back? What if we have a disaster and over recovery plan has a flaw because we didn’t test it properly? What if I’m not as smart as every one in the room thinks I am, and they figure me out? This last one known in IT circles as “Imposter Syndrome” is becoming a large issue for IT people. See my friend Cody De Arklands great blog post for more on this. Being brave is about what you do even when you do feel scared. Maybe I’m just a simple thinker, but this definition of Bravery carries so much weight and truth. I hope it helps you the next time you find yourself about to cross that high bridge of whatever you’re afraid of. Remember Gators method of Bravery. Make the decision to be brave, it’s not something that happens by accident. I promise if you do, you’ll come out the other side, and everyone will notice you’re different and better for overcoming it.